Airsoft GI is proud to present you a brand new package designed to save you stacks of cash, while still getting you out on the field in style. This package features a cool new airsoft gun and 5 of the best mid caps in the market; perfect for picking up a cool new loadout, at a considerable savings. Buying the items separately would cost $524.75. Airsoft GI offers both for the unbelievably low price of $450.00. The KRYTAC brand name is derived from the legendary sea creature, The Kraken. The Kraken was feared, and revered, for it's power and dominance in the sea. No other creature could match The Kraken in strength and speed. The spirit of The Kraken lives on in KRYTAC. The KRYTAC LVOA-C, officially licensed by War Sport Industries LLC, is the pinnacle in M4 rifle design. The unique hand guard provides the user with tactical flexibility and numerous customization options. 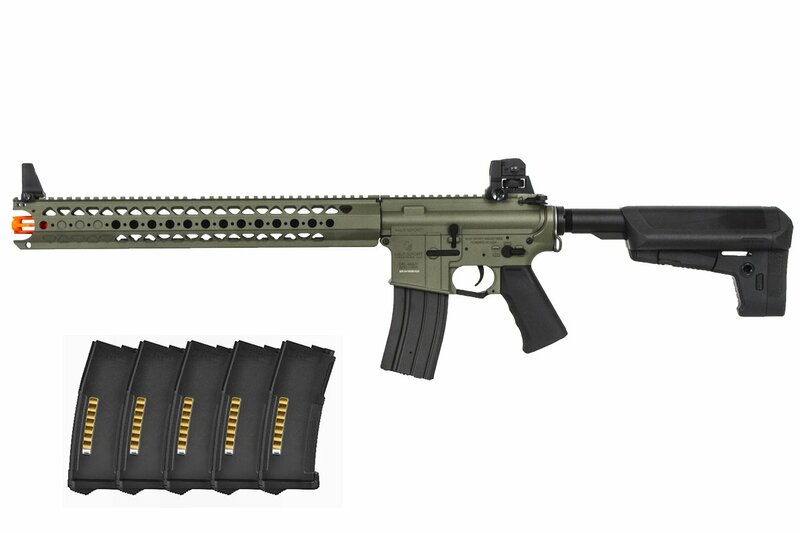 Aluminum alloy receivers feature authentic War Sport Industries and LVOA markings. The War Sport Top Hat flash hider completes the authentic look and sits flush with the end of the rail. Additional features include the KRYTAC Trident pistol grip and KRYTAC battery stock. The fire selector is ambidextrous and the locking bolt plate provides easy access to the KRYTAC rotary hop-up. The KRYTAC LVOA-C is the only officially licensed LVOA AEG by War Sport Industries LLC and is faithfully designed to be the ultimate field rifle. Internally, the KRYTAC LVOA-C features a reinforced 8mm ball bearing gearbox with integrated MOSFET to regulate electronic signals and to protect the trigger contacts. The corners of the gearbox that surround the cylinder feature a smooth radius, as opposed to a 90 degree angle, to prevent fracture. Also, the gearbox shell features a small window on the left side where lubrication can be applied directly to the gears or piston, this window is also convenient for inspecting the angle of engagement with the gearbox fully assembled. Additional gearbox features include a modular spring guide system that will allow the spring to be changed without completely disassembling the gearbox. The KRYTAC piston is made of a durable, lightweight, polymer and features 4 metal teeth, with the 2nd to last tooth absent. The Cylinder head is padded with an enlarged rubber bumper to optimize the angle of engagement and to absorb energy form the impact of the piston assembly. The material for the gears have been especially formulated to be very strong, Rockwell test figures on the KRYTAC gears are much higher than industry norms. Turning all of the drive train components is the KRYTAC high torque motor, capable of 30,000 revolutions per minute unloaded.